Akron, OH -- I am Steven Myers, and grew up within sight of what is now to be BSA's newest high adventure base. I am a scoutmaster and crew associate advisor that learned to take on leadership after making my lifetime committment to scouting with my scoutmaster over 40 years ago. I received my Eagle in 1968 from Scoutmaster Joseph W. Bragg in Troop 91 Mount Hope, WV (of the Buckskin Council). The legacy he left cannot be underestimated. To him and all passed Scoutmasters who have gone home we pray we can have the influence on our world that they have had. I can only imagine how proud Mr. Bragg would be, watching The Bechtel Summit being built accross the by-pass. I have an interest in this base because it is being built in my home town Mount Hope, Fayette County, West Virginia. This page is partly to highlight my beloved home town and troop and partly to show my debt to my scoutmaster for the legacy he left me. I will be improving this page from time to time, so check back often. And yes I can speak on the SBR at the drop of a hat. Just contact me at myers@uakron.edu. (my professional web site is here where you can find links to my Facebook and Twitter and more). Coming July 13-21, 2013 and held next to the National Scout Jamboree, the Mount Hope Trade-O-Ree will be the ultimate Scouting Memorabilia show of the summer! Listen to my former SPL and current mayor of Mount Hope Michael Martin discuss the Summit and the Trade-O-Ree. The 2012 Summit Shakedown is history and we had a ball being there. Check out our slideshow of pictures. We were Venturing Patrol D in Crew 331 and were combined with two Venturing Patrols from Winchester VA and one from Lawrence KS. Stay in touch with what is going on at SBR and the Jamboree News by the Official Summit Blog. 2013 Jamboree FAQ click here for information on how the 2013 Jamboree will be different and better! I gave a talk that day on SBR that you can find on the NationalJambo.org site. 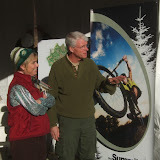 Shape the Summit - Log on to answer survey questions about what you want at the Summit. You can win BIG! jump to the links below including The Summit's Facebook link, Twitter, document links, and more. SummitCorps will bring 2000 scouts to build a trail system near The Bechtel Summit. (NEW) Details on the trail building from newriverwv.com! A huge success, read about it here. View the Adventures in Service Videos as Crews 32 & 44 work and play at the Summit in 2010. View my pictures of the groundbreaking. The Chief Speaks -- Want to go? CHARLESTON, W.Va. -- The Boy Scouts of America has awarded more than $20 million in contracts -- mostly to West Virginia companies -- for the construction of a National Jamboree Center in Fayette County, a scout executive said last week. Project Arrow is the national committee that let the team to pick the new site for the Jamboree, A Summer Camp, A High Adventure base, a Leadership Center and more. The Summit is being built on the Garden Grounds near Mount Hope to the west and Glen Jean and Thurmond to the north and Prince to the south. I toured part of the Garden Grounds on Thursday December 3, 2009 and took these pictures. some of the links below also offer pictures. Jamboree construction starts in Fayette county. The 4-C Economic Development Agency has changed its name to the New River Gorge Regional Development Authority. BSA 7.5 Mb pdf detailed map of The Summit with camps and program areas. Wow! I was proud to be a part of Troop 91 Mount Hope WV sponsored by the Lions Club. My Scoutmaster Joe Bragg was a tremedous influence in my life and I credit the hundreds of scouts who have been in Troop One Akron as part of the legacy that Joe Bragg has left. It is my legacy to see that his legacy lives on. One way this lives on is through the Eagles and other honored scouts of Troop One and the volunteers that make Troop One able to help build those future leaders. Many volunteers have left a legacy I can never match including their effect on me. Houston Morgan is one such man.